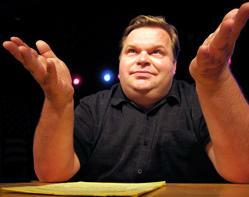 The public radio show This American Life has retracted an entire storyline told by comedian and self-described Apple fanboy Mike Daisey that aired in early January after Daisey's translator said he made up significant details of the tale. In a press release, the show says the episode was the most popular in its history and was downloaded 888,000 times. The episode also sparked a petition for Apple to improve its working conditions that was signed by a quarter of a million people. Daisey said in the 39-minute episode that he became curious about the conditions of Chinese factories where Apple products are made after he discovered photos of factory workers that were left onto his iPhone by mistake. He travelled to the factories in Shenzhen, China and interviewed workers there, who told him they endured terrible working conditions. Daisey described meeting workers whose hands were shaking after they were poisoned with the neurotoxin hexane and meeting several children right at the gates of the factory who were as young as 12 years old. The China correspondent for the radio show Marketplace, Rob Schmitz, wrote that he decided to track down Daisey's translator after he found it suspicious for Daisey to ferret out some of the worst labor abuses reporters have been hunting for years in a six-day trip to the site. Translator Cathy Lee told Schmitz that she never saw the underaged or poisoned workers, and that she also never saw armed factory guards, which Daisey describes. So why didn't This American Life talk to Cathy Lee earlier, before they aired the episode? In a press release, the show says Daisey told them he lost her cell phone number. "At that point, we should've killed the story," show host Ira Glass said in the release. "But other things Daisey told us about Apple's operations in China checked out, and we saw no reason to doubt him. We didn't think that he was lying to us and to audiences about the details of his story. That was a mistake." This American Life said it did "weeks of fact checking to corroborate Daisey's findings," when airing his original episode. A new episode explaining how the show was duped will air Friday at 8 p.m. According to Schmitz, Daisey admits on the show that he never talked to poisoned workers. Daisey, however, stands by his original storyline. "It uses a combination of fact, memoir, and dramatic license to tell its story, and I believe it does so with integrity," Daisey said on his blog. On the show, he struck a more contrite note. "I'm not going to say that I didn't take a few shortcuts in my passion to be heard," Daisey says, according to the press release. "My mistake, the mistake I truly regret, is that I had it on your show as journalism, and it's not journalism. It's theater." This American Life isn't the only outlet that has had to retract Daisey's claims. The New York Times added an editor's note to an op-ed by Daisey published after Steve Jobs' death in October. The paper removed a paragraph from the original op-ed about a factory worker with a gnarled hand whom Daisey said had never seen an iPad before he let him see his. Though Daisey has been caught making things up, other reporting has turned up problems in some of the factories that help make Apple products. The New York Times published a series on Apple's business practices, including the working conditions in its suppliers' Chinese factories, later in January. It said more than 100 factory employees were injured after using a poisonous chemical to clean screens, and two explosions in separate iPad-making factories caused multiple deaths and injuries. Workers were packed into dorms and pressured to work 24-hour-a-day shifts, and some underage workers have helped build Apple products. Apple wouldn't comment for the Times article. Correction: An earlier version of this article misidentified Marketplace as an NPR radio program. It's actually produced and distributed by American Public Media, not NPR. This American Life is distributed by Public Radio International.